Liverpool Bar – did you know we have a bar attached to the studio? Hot and Cold Drinks and Food Available. Will not however tattoo you if you have had Alcohol. REAL ALE, CRAFT BEERS, WINES AND SPIRITS FOR CONSUMPTION ON AND OFF THE PREMISES. A LIVERPOOL BAR & HAVEN FOR WAYFARERS TO SEEK REFUGE AND SHOOT THE BREEZE, WITHOUT POMP OR PRETENCE. Imagine a Liverpool Bar 2 mins from the train and bus stations with friendly staff, 6 Cask Ales, Real Cider, Craft Beer on Tap and over 50 Bottled Beers. Epic Jukebox, Free WiFi, Board Games, Take Out Draught and Loyalty Cards… Imagine no more come seek Sanctuary. Wide range of spirits including Gin, Vodka, Whiskey, Rum. We also operate a Loyalty Card Scheme and offer discounts for: Camra members and the armed forces and emergency services. 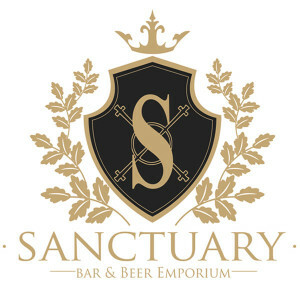 Sanctuary Bar was born out of a desire to provide a welcoming environment without the hustle and bustle commonly found in a busy city centre such as Liverpool’s. We consider Sanctuary as a refuge from the chaos. A place to chat and form friendships over quality drinks. We welcome tourists, travelers, students and locals alike.